Can you tell I had CAS card in mind :D ? 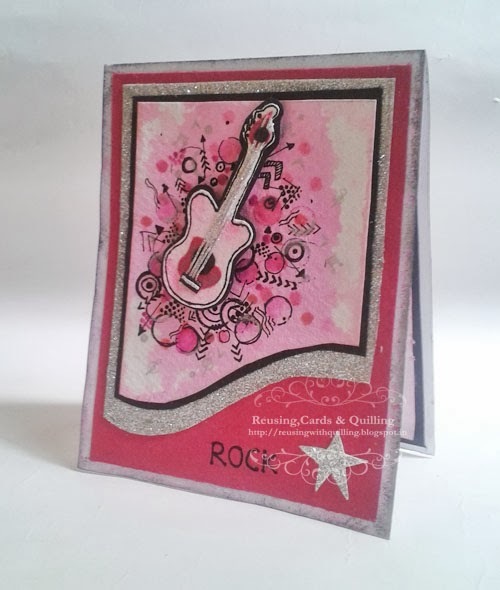 I need to work a lot on this style..
Drew the guitar on water colored paper ,made the strings by cutting very thin strips of glitter paper.I have glued the guitar on a black chart paper fussy cut it and then popped the Guitar with foam tape on card. wow what a stunner..love the guitar..thanks for playing along with CSCC..good luck! Curious to know whether the shade behind the guitar is a shadow of the guitar added using foam tape or is it shaded by you to show the depth.. I love this card Pooja! its stunning! The guitar you drew is awesome and the background looks awesome! Amazing artist you are, pooja and look how you have used it in a CAS card( am no authority in this) But it just looks amazing ya! I can only agree with the others - a stunning card Pooja! I LOVE the doodling behind the guitar and that guitar itself is so clever. A wonderful card beautifully made - thank you for sharing it with us at Unstampabelles! I love all the different details you have here. The curved mats, the hand drawn guitar and doodles and your silver strips for guitar strings - really! You rock! Great card! This card is AMAZING!!! Wow! I love every single detail! Thanks so much for joining us at Fusion! It's a lovely card Pooja!!. I think this card is both masculine as well as feminine. Really a clever take on all the challenges. Wow! Pooja! This is super catchy!! What a style!! I love your water coloring soo much :) the guitar is amazing!! Wonderful creation. Guitar and the doodle looks fabulous. 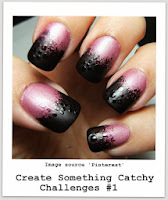 Way to go bold on this with the pink and sparkle! Such a fun card! Thank you so much for playing with us at Fusion this week! Now that is dedication cutting those thin silver strips for the guitar strings. Beautiful card…saw you over at Unstampabelles. oh my favorite word on a super delish card! I bet those strings are super delicate! NICE JOB! Well well well.., Pooja this is a rocking card, I love the detailing behind the guitar n ur hand drawing is mind blowing :) so happy to see u at Fusion n CSCC !! what a great card! 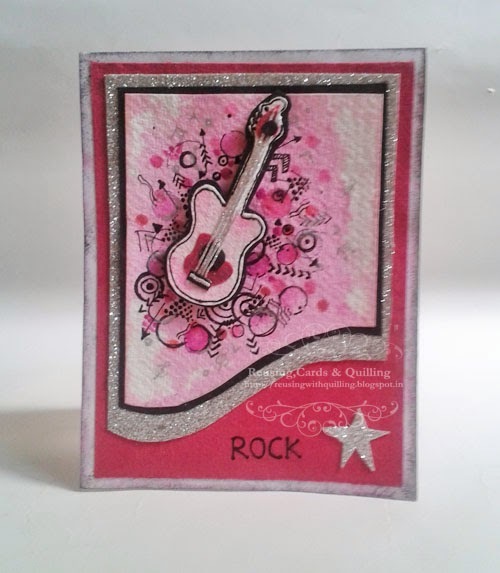 love all your doodlings behind the guitar - and so cool in pinks! Thanks for joining us at Fusion! This is a lovely card. Clever drawing. 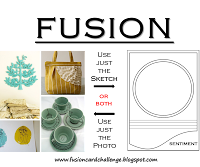 Thank you for joining the challenge at Unstampabelles. Rockstar Pooja!!! This is so awesome !!! U r a true Rock star...Love the doodling behind the guitar...Whole card is superb!! Lovely card, Pooja. Loved guitar and doodling. What a fabulous card , really admire your efforts ....so perfect and neat ! love all the gorgeous details on this one. Stunning card, Pooja! It looks as if a girl is engaged with Guitar strings in her own world. 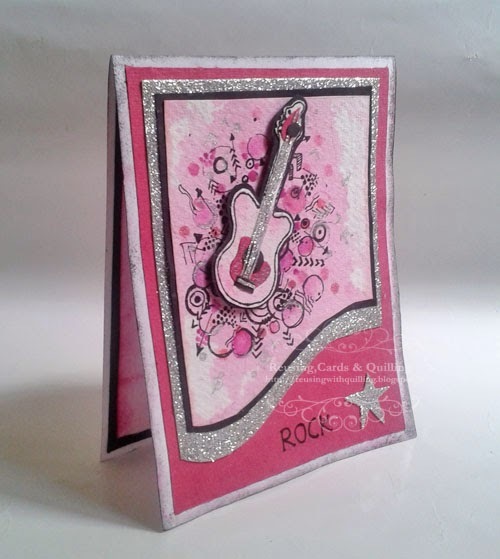 I liked whole theme of the card, and especially background, arrows, circles and pink color create a drama! Adorable make! very pretty card. I love the color and details. You are rocking girl. You always come up with awesome stuff. Thank you so much Pooja for joining CSCC#1. Absolutely glittery and stunning!!! I really love it!! Its a superb card! Love the colors and details! Keep going!